EXTassays are multi-parametric (multiplexed) cell based assays that allow assessing cellular signalling events, or profiles. Signalling profiles are cell type specific and can change upon the addition of a given stimulus, like a drug candidate. The readouts of the EXTassays are based on small oligonucleotide reporters termed Synthetic EXpressed Oligonucleotide Tags, termed EXTs. EXTs are quantifiable reporters serving as unique identifiers for a given cellular signalling event, and they are designed to evaluate simultaneous signalling events in a multiplexed fashion. Importantly, EXTs are amenable to Next Generation Sequencing (NGS) allowing the analysis of large, multiplexed data sets. 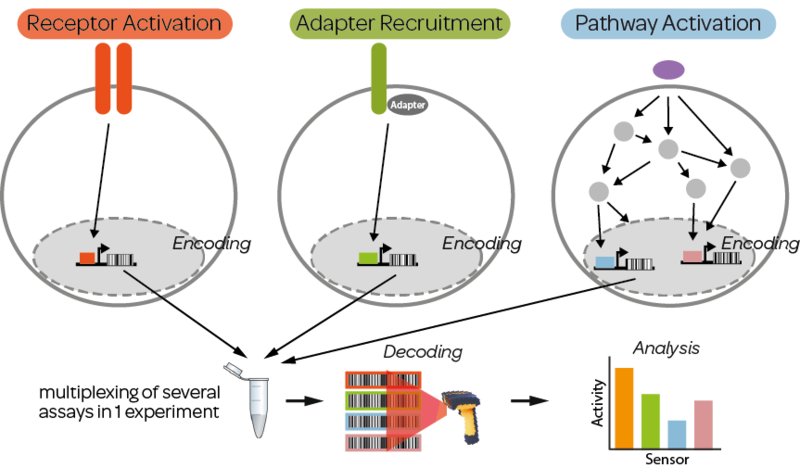 The EXTassay technology has been initially described using 30 individual pathway events that were analysed simultaneously (Botvinnik et al, 2010). Multiple cellular signalling events, like the dimerisation of a receptor tyrosine kinase (left), a phosphorylation-dependent recruitment of an adapter protein to an activated RTK (center), and activation of various downstream signalling events (right) can be simultaneously measured and analysed using EXTassays. All illustrated signalling events may occur in the same cell, depending on the individual experimental setup. For the EXTassay analysis, the RNA is extracted, decoded (reverse transcription, amplification by PCR), and analysed using NGS technology.